Two new continuous dual-frequency GPS sites and a repeater were installed on Sierra Negra volcano, on the island of Isabela, Galapagos, Ecuador. These stations augment a continuous, telemetered network installed in 2002 (2002 Network Installation) of two dual-frequency sites and four single-frequency GPS sites. Since installation, the network has documented deformation associated with trap-door faulting events along faults on the south side of the caldera, and 6 meters of contraction associated with the October 2005 eruption. The two new continuous sites were installed on the south side of the caldera, to better constrain motion associated with the trapdoor faulting. PIs Dennis Geist (University of Idaho) and Bill Chadwick (Oregon State University) have used GPS to monitor deformation at Sierra Negra and Fernandina volcanoes since 2000. 2005 was a big year for both volcanoes, with an eruption at Fernandina in May and at Sierra Negra in October. Eruptions in both cases were from circumferential fissures, a unique attribute of Galapagos volcanoes. 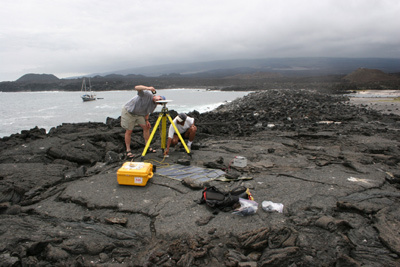 Concurrent with recent permanent station support, UNAVCO provided equipment and field support for GPS campaigns on both volcanoes. 43 campaign markers were measured. GPS data will help determine how the dikes were emplaced that fed these circumferential fissures. 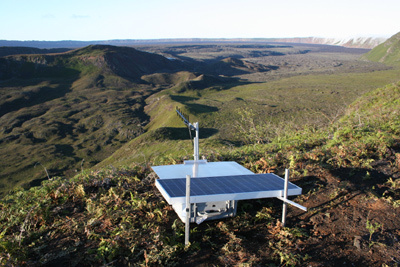 Figure 1 - The new South Rim Repeater overlooking Sierra Negra's caldera. The master radio is located on the north rim of the caldera, visible in the distance. Figure 2 - Bill Chadwick and Gorki Ruiz set up a campaign system on the coast of Fernandina.